Rookie Card (Photo) from philadelphiaeagles.com. The Penn State (ranked #7; seeded 3) Men's Volleyball Team has advanced to the semi-finals of the NCAA Championship. The face off against UC Irvine (ranked #3; seeded 2), Thursday (5/3) evening in Columbus, OH, is a rematch of last year's semi-final match. The Penn State-UC Irvine match-up will be shown live on ESPNU and tape-delay on ESPN2 on Friday, May 4 at noon ET. The National Championship match will be held on Saturday, May 5 at 7:00 p.m. and will be aired live on ESPN2. GO LIONS! BEAT THE (I kid you not) ANTEATERS! 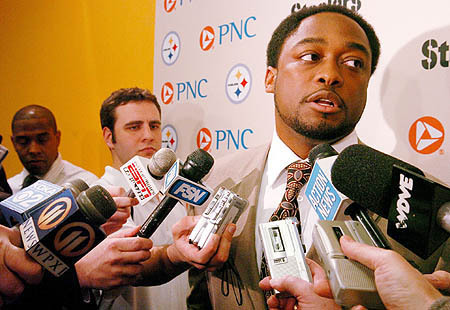 With the broadcast of the NFL draft this weekend - we got a good look at the Steelers' new head coach, Mike Tomlin. Dude has tightened up and, reportedly, made good friends with Jerome Bettis' former "barber." What eva' he's doing - it's the right thing. Updated link - the Collegian totally switched the link! Stinkers! Seriously, at 10:53am this morning - the above link went to the "breaking news" story about the football team - now, click on it to read about the Volleyball coach. Yeah, I have a Tailgating Blog - but who cares if I cross-blog? Me? no. You? Michael Madeira? clearly not. 1. Melt 3 T Butter and the oil in a large heavy pan on medium-low heat. Add onions, cover and cook until soft and translucent (stir occasionally). On Medium-high heat uncover and add sugar and salt to taste. Saute, stirring often until onions are very soft. 2. Reduce heat to Medium, add flour, stir and cook for 2-3 minutes. Blend in 2 cups of stock; add remaining stock and wine. Season to taste with salt and pepper. Simmer about 30 minutes. 3. Preheat oven to 425F. Slice bread into thick slices (soup should serve about 8). Butter both sides of bread (with reserved butter) and toast until both sides are golden brown. *can also use day old baguette and skip toasting. 4. Place one slice of toast in each ovenproof bowl, fill bowls with soup. Spread a thick layer of cheese on top of soup. Set bowls on baking pan and place in oven until cheese has browned. ** we've adapted FOS recipes for tailgating in the past by making the broth and "crouton" (sliced baguette toasted with cheese) adhead of time. Heat the soup at the tailgate; place a crouton in insulated bowl/cup; pour warm soup over crouton. Have some extra cheese for on top! You can find the rather lengthy transcript for Joe's post Blue/White press conference at GoPSUsports.com. Joe talks about the game and the players and goes on for a bit about the VT tribute - and, he even quotes poetry at the end. That JoePa. It was a great weekend - pictures and comments to come. I will admit that I only watched the first half of the game (I have some excuses - boring) - and, as always, it's difficult to assess anything other than some quickness and general physicality. Folks were more impressed by the "alums" walking the sidelines. In Men's Gymnastics anyway. Hey - a national title is a national title. The competition will air on ESPN2 at 2:30pm, Tuesday, April 17th. Getting ready for the Blue White game - things are crazy with the team right now - but we're soldiering on with our preparations. The game is Saturday, April 21st, at 2pm. Parking lots open at 8am - and we'll be there when they do. We'll be parking in the lots outside the West stands. The "theme" is, as always "Practice" - but we're adding an Italian flair this year (in honor of coach Paterno). SI.com has released preseason Power Rankings (per Rivals.com) for specific positions. Not surprisingly, Danny Connor is the number one Linebacker. SI on Campus also highlights University Park in their Road Trip series. When ever I write the word "State" - in my head, I spell out "S-T-A-T-E - go State!" And whenever anyone (on television, in general conversation, in writing) asserts "We are..." I always (serious now) answer back "Penn State." Which is a little odd, because my entire football life (except for that one year, right after graduation, when I sat in the West Stands - chalk it up to youthful bravado) I have sat in "We are" territory. So - I have to ask - Is this weird? Do you all do this as well?